Our whitepapers are written by industry practitioners with many years of experience and deep subject-matter expertise. Our whitepapers are free to download; we only ask that you provide a valid email address. To download a whitepaper, please provide your email address and then click the green button that appears below the email field to view the whitepaper PDF. What happens to your information after you submit your email address? Today, mobile devices are nearly ubiquitous. According to the Pew Research Center, 95 percent of Americans own a cellular device of some kind and 77 percent of that share belongs to smartphone owners. Statista estimates that the number of mobile phone users will surpass the five billion mark in 2019. The vast majority of these mobile device users? Young people. The ones that make up the new workforce. It is of natural consequence that the popularity of Bring Your Own Device (BYOD) has increased exponentially in recent years. Enterprise organizations are coming to grips with millennial and Generation Z employees who won’t give up their devices or take a corporate-owned without a fight. Mobile devices are becoming ubiquitous in business, and for good reason. Systems demand mobility, and companies must move – often rapidly – while maintaining access to a wide variety of technologies. Lost BYOD smartphones from theft or staff negligence could be your biggest threat to data. Data security standards have been around for decades yet standards enforcement has been lacking. This paper explains why GDPR will change the playing field next year, what GDPR means for endpoint data management, and offer 5 tips to help maintain compliance. Are you/will you be prepared? IoT is here, fueling the fire for cyber risk via mobile sources. By 2020, there will be more than 1,000,000,000 M2M (yes, a billion plus!) connections, each device module capable of accessing your network by a malicious hacker. Are you/will you be prepared? A recent study by Gartner, Inc. projected that by the year 2018, 70 percent of mobile professionals will conduct their work on personal smart devices. 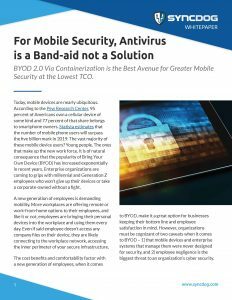 The report cites three key operational challenges enterprises will have to deal with as more personal phones and tablets invade the workplace – governance and compliance, mobile device management, and security. Best-practice IT security dictates that you monitor event logs with a correlation engine to proactively manage cyber threat. Download this paper for more details on mobile device event log correlation.